Verbal memory is the skill that makes students most efficient in school and with homework, particularly in elementary school. Verbal memory is the ability to remember what you read or hear. It includes your ability to hear or read a word, sentence or paragraph and then recall it when needed. Why is Verbal Memory so important? A lot of in-school learning involves reading, listening or studying and then recalling it when needed. 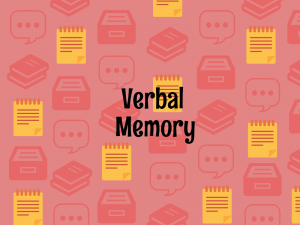 Remembering vocabulary definitions, key details in a story, or the name of a species are all examples of verbal memory. While it’s true that technology is a good enabler so that students don’t need to memorize nearly as much as they did in the past, students still need to efficiently remember. Think about how much longer it would take to read if you had to look up more vocabulary words. Or how difficult it is to write an essay if you are struggling to remember examples. Just as with verbal reasoning, verbal memory can be just as important in math and science class as it is in English and history. Is my student struggling with Verbal Memory? Signs of a student struggling include weaker vocabulary or a student who forgets story details even if they understand the main idea. Students who often say “I forget” or who take longer than you might expect to do homework might be having trouble with verbal memory. How do I know if my student needs help with Verbal Memory? If you suspect your child is struggling with verbal memory you should discuss your concerns with a school counselor or your pediatrician. Since difficulties with verbal reasoning, visual memory, or working memory could look like verbal memory difficulties, make sure they use an objective test, not just observation. If you are uncomfortable talking to someone but have concerns, try a verbal memory test at home and then make a decision if you need to speak with a professional. If your student’s verbal memory is fine but you’d like to help them be more efficient with homework, there are plenty of strategies. Dual-coding or using pictures or saying what you read to reinforce will help. Spacing out studying (rather than cramming) is important for students with weaker memory. Also rely on their stronger skills. If your cognitive screener indicates that their visual reasoning skills are stronger, teach them how to use pictures and visual imagery will help. Every student is different, and the strategies will depend on their unique combination of strengths and needs. Check out our verbal memory test!